When it comes to one of my all-time favorite music artists, Jill Scott undeniably makes the list of artists that I can listen to multiple times and never grow tired of hearing. Scott, who is affectionately known to her fans as “Jilly From Philly” has recently released a new single and now fans are patiently awaiting a full album to accompany the single. Scott is a true artist as she doesn’t simply just release album after album for the hell of it, but rather she takes her time in releasing her soulfully skilled music that she has often dubbed “food for the soul” and just as food takes time and perfection to cook and taste good, so does good soul music. 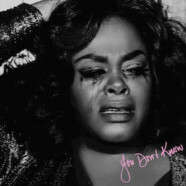 With her new single, “You Don’t Know,” Scott gets the recipe just right with this rhythm and blues inspired ensemble that literally makes you want to cry the minute she sings the first verse. The lyrics are carefully mixed to perfection and the live band brings the entire ensemble together in perfection. Fans of “Jilly From Philly” have begun getting use to the fact of seeing the poised songstress starring in blockbuster hits all the way to made for TV films, but has never questioned her loyalty to the music. Her last album, “Light of The Sun” was released in 2011 and it brought us the famed single, So In Love featuring Anthony Hamilton. There is currently no word as of yet when we can expect a full album that currently dawns Scott’s latest single, but more than likely it will be worth the wait as Scott never disappoints with her music mannerisms. You Don’t Know opens up with Scott asking one simple question: Did you ever know what it is to be heard? After listening to this song over and over again, it finally struck me what she meant by posing this question in her song—sometimes you don’t know what love is like until you’re heard by your partner. I have a great feeling that when an album release is announced, the album will be on point and will sweep away the critics during awards season this year because it’s no secret that Scott have oftentimes been snubbed during past awards seasons.